Beer: eclectic range in excellent condition. Service: erratic, friendly when they have finished their own conversations. This is a frequent event. Food: particularly good pub grub without pretension. Mrs TJ dragged me in to this little boozer the other day...! The White Swan never ceases to amaze...! You can only seat about 40 people in the main bar area (front part) and that would be a cosy squash..! But they have 2 x open fires, for those cold wintery evenings - how splendid! But, how can such a small pub, so far off the main track, survive & make a trade...??! Okay Paul from Norbiton, your meal was luke-warm, that is not acceptable, really. BUT, what a nice pub it is, hey..??!! After a long riverside walk, forget the Slug+Fettish, and the noisey pubs in the high street, get your sat-nav working, (or compass if you're old-school..) and RVP in this delightful pub, if you can find it...!! Have used the pub several times in recent years for a drink. Always convivial and civilised, its off-the-beaten-track location offering a nice antidote to the chain boozers that have taken over Richmond’s pub trade. Tried what looked like its gastro food offer on Saturday along with three friends. Even though every table in the pub had a reserved sign, when the staff discovered we wanted to eat, a table was found for us. But have to say that my food was very disappointing. I can’t see what excuse there is for serving up lukewarm steak and chips (it doesn’t come any easier surely?). And at around fifteen quid, on the most popular night of the week, that’s a cardinal sin. Also, question for the chef, why oh why cover half the plate with salad? Do they serve steak frites in France with salad? You bet they don’t. It must be obvious that if you’re ordering steak, you’re doing so because you want meat/flesh - not leaves. I always feel this is a ruse to make the plate appear ‘full’, but it really jars with an old dog like me who is wise to most of the cynical ploys of the restaurant trade. Put the meat and chips on a smaller plate, I won’t be offended. 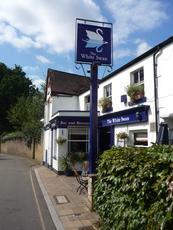 The two best pubs along the river in Richmond are The White Cross and this one. It’s slightly tucked back from the riverside compared to the Cross, the benefit of this being that you don’t have to purchase a tide clock in order to guarantee entry and exit! Also, not being in eyeshot of the Thames path means that the tourists are fewer in numbers. 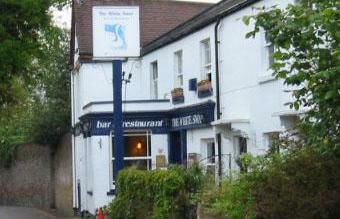 The pub consists of two main rooms, the front one being the original and the back room an extension. There is also an upstairs dining area which I’ve not seen in use and maybe for hire only. It has a lovely homely atmosphere in the winter affected in no small part by the fire (high end imitation, not real coal or log unfortunately) and the lack of music. It’s a lot smaller than the Cross and can get crowded in the evenings. Beers include Tim Taylors Landlord but not a great selection in all honesty. There are always a couple of real ales although nothing adventurous, the usual selection of high-street ciders, and not a great deal else. I’ve only eaten there once but had a very well prepared poached Atlantic salmon with sweet potato and goats cheese mash. The staff are generally very polite and helpful although I will say they tend to be a bit over zealous at putting the reserve signs on the tables in the main room; they seem to be moving more and more towards treating the whole place as a restaurant in the evenings which leaves little room for the drinkers. It’s a shame but I imagine being tucked away as it is it needs to attract a good number of patrons for more than just a couple of pints. In summer I’d always stick to the White Cross, but as the afternoons darken in the winter I think this place really comes into its own and is well worth a visit particularly late afternoon.